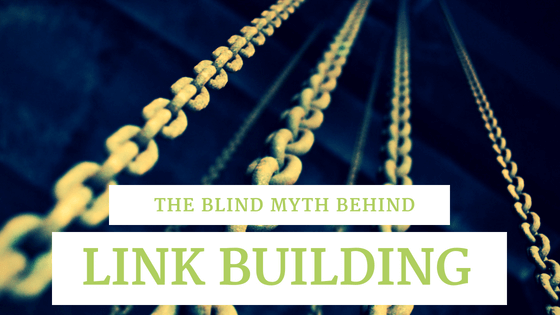 There is a blind myth behind link building. People think that building links could instantly cause them good rankings. It does but that doesn’t mean driving links alone could make more sense. The process involves a lot of twists and turns. We would like to explain to you a certain impedes that affects the betterment of link building. Also, in this post, you would find better ways to improve your link building techniques that could help you rank better in your market. Let us crack this down and look what actual link building could do. Link building, in a nutshell, It is obtaining hyperlinks from other websites to yours. You need to input a lot of effort in order to obtain quality links from authoritative websites. And that is why most SEOs spend a lot of time in finding the best links for their website. So how does the search giant honor link building? Google values websites with external links, especially the ones that are authoritative. The Google bots crawl on links including individual pages as well as the entire website. Thus, pages that carry authority links are valued by Google bots. The importance of having quality links is at the peak. Unfortunately, it is treated with less value believing the blind myths that add no value to the process of link building. We have gone through a certain analysis process to find out why initial strategies of link building are not effective. Then we were able to identify that most of them were myths. If you are following one of them, you definitely have to consider reworking the process of link building. Let us have a look at some of the common myths that we were been following for decades. The myth came into existence when the penguin update hit the web. The penguin update analyzes every single link that is on your website and penalizes sites that weed out link spam. This doesn’t mean that the update has completely ruined link building process. Penalization of the website is done only when the website is enriched with black hat strategies. The black hat strategies are utilized by webmasters who try to manipulate ranking through spam links. But that is not going to help anyway. This seems to be the biggest myth that one could believe on link building. The second most important myth is the belief that ranking is completely reliable on link building techniques. This is partially true. Yet, Google examines the authority of the links and the trustability of the websites that pass link. But this perhaps does not improve your ranking. People failed to understand that link building alone is not the major part of Search Engine Optimization. There is a lot more through which one could improve ranking. But relying on link building alone is not going to help anyway. It was a familiar myth about including keywords on the Anchor text of your links. This is done in order to increase relevance with keyword terms that users normally search on search tabs. But, Hummingbird and Penguin update was too keen on finding out the stuffing on anchor texts. Moving forward to penalize the websites that were caught stuffing keywords. Rather, one could make use of relevant content on the anchor text that looks accurate and contextually appropriate. The worst myth that has ever taught. Especially when it comes to entry-level practitioners, it is educated that links from an authoritative website could rank better. But that is not going to work the way you think. There is a law of diminishing returns essential to sources of the same quality. By then, when you build equivalent links from the same website it becomes valueless. Thus, one quality link from an authority website would matter much when compared to dozens of low-quality links from sources. Link sharing is one big mistake that people do on the web. No matter you know a website owner personally or not. Link sharing is not recommended. People spare most of their time trying to share links which eventually turns to be useless. Rather the simplest way that you could really invest in the guest post. If you wish that you wanted to generate quality links without even begging website owners, you could prefer generating a guest post. Really the simplest way to grab the attention of your users as well as obtain quality links from authoritative websites. Moreover, Google loves content and more content. So, you automatically generate a quality link by yourself. What would be the best way to overcome these myths and generate quality links? To make it more understandable we would like to take you to the ancient days where Yahoo and Alta Vista were the top search engines that ranked search results based on the content they had on their websites. When it comes to Google, the strategy was completely different from the other search engines. While they looked at the content, Google started to look at the links that connected the content of the page. Thus, this became a realistic strategy where links were considered to be the quality of a web-page. To make it more authentic, the Google’s Penguin update came into existence which eventually scared every single web owners. Because people who hardly bothered about link building and the ones who generated links through black-hat techniques had to take measures in order to protect their websites. Thus, the need for genuine link building came into existence. Now let us have a look at genuine link building without any impede of myths. Any links that are intended to manipulate page rank in Google search results is expected to violate Google’s webmaster guidelines. This may also include behavior that manipulates links to your site or outgoing links from your site. You could ask for links or you could generate links with the help of your friends, relatives, and colleagues who own a blog. You can ask them for content-oriented links rather than the backlinks that are normally placed in the sidebar or footer. Make sure that the link you obtain to your website is from a relevant website or niche. Else, it may have an impact on your website as well as bother your users. Testimonials are a form of win-win strategy. There are businesses that give users a chance to share testimonies on their products. This is the simplest technique to build trust. You can make use of this opportunity to build backlinks. You can start sharing testimonials on company websites that accept them. This gives you a chance to generate a backlink and also benefits the company with a positive testimony on their product or service. Rather than depending on the blogging sites you can generate your own blogging site where you may share your content and generate quality links. You can possibly create a content-based site where you provide valuable information to your audience as well as show Google that your links are content intended. Make sure that you generate a timely post and maintain consistency in what you do. There are chances of gaining authority. But you need to be very clear to generate relevant, useful and well-structured content. Something that is tricky but advanced technique. Yes, it is knowing the strength of your competitor. There are tools that can analyze the links that are available on yours, as well as your competitors. You will be able to find links that your competitor might be using and which you were not. At such case, make use of the Common Backlink Tool (CBLT) to discover the backlinks that your competitor’s use. Enter a sum of 10 competitor’s URL and generate a report. You will be able to find not only their backlinks but also their sources and techniques. It is just that your competitor might connect the link to the same site. The Link Juice Thief (LJT) finds your competitor’s backlinks and where they are linked to. You will be able to find areas that are highly authoritative and might even link to your niche. A link from such places could add more value to your website. There is something more about it: When you plan to connect to such authority links your competitor automatically tries to link back to you. By this, the Link Juice Thief helps you to drive in high authority links to your website. The most important thing that we always recommend is to make sure the backlink you prefer is from a relevant niche. In case someone has written something about you or mentioned you on their content and have failed to provide a backlink, you could contact your webmaster and request to convert those mention into a valuable backlink. It is really simple to proceed with the process. All you need to do is make use of the LinkResearchTool and start with a backlink profiler report. Then proceed to filter the report with the status > MENTION. Make use of the BackLinkProfiler tool to find the mentions. But when it comes to brand mentions it takes a little more effort to find them. The other resource to find brand mentions is by using the SERP Research Tool (SERP) which provides the advanced search operators. To find the most mentions you need to go for all results from any time or last year. It is good that you use the search engine and language that you target your audience. It is really good that you are mindful of your competitor’s links and their activities. Link Alerts (LA) is a tool that informs you about the new backlinks. You can make use of the tool to monitor your competitor’s backlinks. This is not just meant to find new backlinks but you can make use of it to find new sources and techniques you should use in the future. The biggest advantage of using the Link Alert tool is that you can make use of it to send email notifications about new or fresh backlinks. By this, you will also be notified of the negative SEO attacks that affect your website. In case, if you find any unwanted links you can act instantly and protect your site from Google’s penalty. Are you into the field of “Digital Marketing” for a long time? Have you gained a lot of experience in the niche? Then you are the right person to share interesting and valuable content. You can share your personal opinion about the latest trends and the emerging techniques in the field. You would have come across a lot of research papers, case studies, reviews, and comparisons. They gain a lot of attention from internet users. Be the first to talk about something that is related to your niche. Have you been hitting around the bush for a long time? Now it is the time to get rid of the myths on link building. Focus on things that really help you to carry your business forward to the next level and avoid those that spare most your valuable time. The above information is an eye-opener to those who have to struggle to improve their ranks on the Google search engine. If you are one among them, what do you wait for? This is the right time to fix it up to rank on the first page of Google with some quality links. Hook up with all the above strategies and get your business going.